Practicing yoga without complementing it with a balanced diet, while aiming to lose weight, is fighting a lost battle. 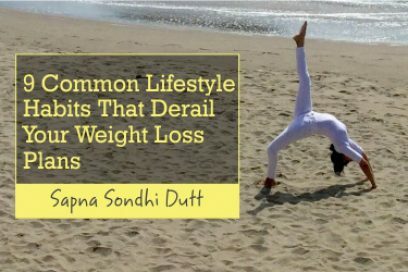 However, addressing both aspects, yoga and exercise along with sensible eating habits, simultaneously, will provide our body with the desired results. In the present day, it is possible to lose weight fast with all kinds of crash diets. But, what is the guarantee that the lost pounds will stay off? Well, the truth is, they won’t. Whatever weight that we might have lost would eventually come back, maybe within a period of three or six months, or even sooner. The reason is that, crash dieting, a short term fitness fad, can slow our metabolism, leading to future weight gain, while also depriving the body of essential nutrients. These “fads”do not really make any steady permanent change in our lifestyle. The process of losing weight needs to be slow and natural. If we want to keep our lost inches and pounds forever lost, then we should exercise regularly and maintain a diet schedule that is balanced and healthy. Sorry, no way around this. There are no other shortcuts. As we exercise, while cutting out all unhealthy food, the body keeps toning up as we shed weight, and there is no flab left to deal with later. When trying to lose weight, the only thing that honestly works is changing our lifestyle. We can do this by slowly eliminating all the harmful eating practices we have gradually slipped into. We should keep in mind that the major portion of our diet should consist of fresh fruits and vegetables. This means that our plate should have a good amount of veggies and a small portion of cereals like multi grain bread and rice. However, if we look at our current food plate, we’ll find that we often end up doing quite the opposite. Our body requires the energy derived from carbohydrates (grains, cereals, rice) during the day when we are most active. Consuming carbohydrates at night will only pack on more weight, because this is the time when our body is ready to rest. The extra calories are not required during dinner and will just end up unconsumed. Our bodies require good and adequate nourishment to perform efficiently. Crash diets or any kind of imbalanced diets end up harming our system rather than helping it. Furthermore, the temptation and convenience of “eating out” challenges us all. We need to remember that restaurants do not have our health at heart. Instead, they often use harsh ingredients in excess to make the food extra rich and tasty. The same holds true for when we are socializing. Party food is packed with a lot of harmful fats in the form of cheese, butter etc. We need to devise little strategies for ourselves to counteract this. For instance, we could eat a bowl of salad before going out on a social engagement. This way we won’t gobble on the rich foods and be more selective and wise about what we eat. The human body requires its dose of vitamins, minerals, carbohydrates, proteins, and fats. This is why we need to eat a vast variety of foods to access all these vital nutrients. We need to avoid taxing our body by overeating. Instead, we need to ensure we eat decent quantities of a huge selection of all seasonal vegetables and fruits. So, how does yoga promote weight loss? Yoga says that we should leave one-fourth of our stomach empty at all times, for proper digestion of food. This way, we would also not tax and strain the internal organs. If we over fill our stomach, large portions of food remain in it for long periods and start to ferment which causes indigestion and bloating. 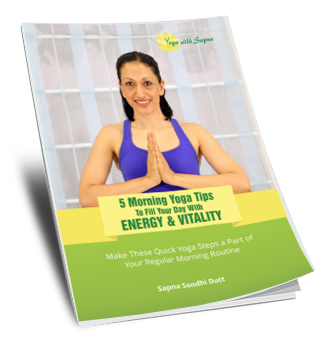 Ensure that besides yoga we are walking sufficiently each day or engaging in any other sport or aerobic exercise, burning more calories than we consume so that the net result is a loss in overall weight, each day. Once we’re committed to following the 3-step plan of regular yoga, lots of walking, and a healthful diet, we will be on a sure shot path to weight loss.